Brigade Week and Brigade Bhela 2016. Church Crookham Gurkha statue unveiling. His Majesty The Sultan of Brunei’s 70th Birthday celebration. Brigade of Gurkhas Golf Championship. First Gurkha Formation Skydiving Team. We hope you enjoy with the accompanying music! 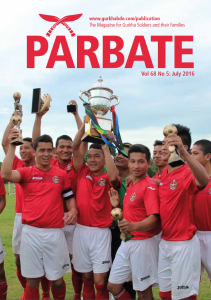 Click on the picture above to read the July 2016 edition of Parbate.